Pressure cookers are not a new thing. These devices have been around for a long time now. They have made life easier to live, reduced cooking time and have basically been a boon for the working class. Be it roasting meat, cooking stew or making bean, anything is easy in a pressure cooker. What ideally takes hours to prepare can be completed in a matter of minutes. All this is simply due to the fact that they utilize the laws of physics in a more concentrated form. Restaurants too use a stove-top pressure cooker, probably because they are the most commonly found and easiest to use. However, with everything going electric or green, it was only a matter of time before anelectric pressure cooker came out revolutionizing the industry. This new type of pressure cooker does an excellent job in replacing the first generation cookers and even takes the same or shorter time to cook. There actually isn’t much difference between an electric pressure cooker and a conventional cooker. They have the same construction and design. The only difference lies in the fact that an electric model comes built-in with a heating mechanism. This heating unit is packed inside the cooker using clamp-type locks that helps keep the heat within and prevents its release. Such mechanisms are better than interlocking lids that are found in many counter-top models of today. As far as normal cooking goes new age electric cookers come with digital controls that let you monitor and control the steam pressure within. Such cookers even give the added choice to set a particular cooking time depending on the dish you are preparing. Electric cookers come with a specific mechanism that automatically vents steam within before it reaches unsafe levels. This quick-release feature is additional to the conventional design and it lets you cook without having to worry about the sudden venting of steam. Basically, you never have to overlook the workings of an electric model leaving you free to look at other activities in the kitchen. Let’s talk about the safety of electric cookers. 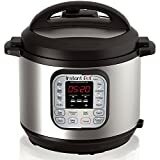 Many electric variants actually come with special features that prevent harm to the user and ensure a steady temperature and pressure inside – like the Instant Pot models. Take for instance, the locking lid or system that does not detach the lid unless pressure inside subsides to below an accepted level. In fact, added security does not let you open unless you manually deactivate the electric connection. The lock itself comes on soon after closing the lid. Such safety features help prevent accidents. In a stove-top cooker, it is easy to leave the lid open partially and not know it. They are in fact notorious for this reason. It can lead to scorching with hot water or the unwanted release of steam. Electric pressure cookers help avoid such situations. One last advantage of an electric cooker is that it is cleaner than a stove top cooker. Since these cookers come with removable cooking inserts and the pots are finished with non-stick coating plus stainless steel construction, cleaning them afterwards is much easier than handling stove top pressure cookers. The biggest drawback of electric variants is that they aren’t great at measurements. Since electric cookers come with digital controls, monitoring the exact cooking process is difficult. Precision is something that cannot always be achieved through digital control. To do this it needs to be accurate in pressure and temperature measurements. Basically, the gauges of electric models usually are not 100 percent accurate. So, you may have to do some amount of guess work to get things right the first time around. For those who have never before used pressure cookers getting used to this odd system of trial and error cooking can be irritating. Thankfully, this single drawback of electric cookers is overcome by the presence of a manual pressure release system. While it automatically vents pressure before it gets too high, you can force stop the cooker if you feel that the dish is ready. You also have to take into consideration that an electric pressure cooker is an expensive proposition. Not only does it cost more but also runs off electricity, which is not cheap. While stove top pressure cookers aren’t environment friendly, electric variants aren’t pocket friendly. It all depends on what you want the most from your pressure cooker.